Oklahoma always recruits well in the state and four straight Big 12 titles offer Lincoln Riley and his Sooners a certain clout that the in-state schools simply can’t match. The SEC, rightfully or not, is a real selling point to young prospects who all aspire to reach the NFL and play for national championships. Fisher is the only in-state FBS head coach who’s won a national championship as a head coach. All three finished within the top six of the recruiting rankings in 2019 — Texas ranked third, Texas A&M fourth and Oklahoma sixth. There’s no real difference in the overall classes. The numbers are mostly arbitrary and came down to adjusted rankings after the 2018 season. Oh, and Bru McCoy helped. The only real way to declare a winner is to take a look at which programs won position groups. We’ll start with the offense. The teams are listed in order of position ranking. Each team signed a single signal-caller so that made this position group easier to grade. It came down to the best player and Rattler, on paper, is destined for future greatness at Oklahoma if his head coach ever decides to let a quarterback recruited from high school run the program. Rattler gets a year to sit behind Alabama grad transfer Jalen Hurts. Rattler is the No. 1-ranked dual-threat quarterback in the 2019 class and was the most consistent quarterback I saw at The Opening and at the All-American Bowl in San Antonio. Johnson ranks ahead of Calzada because he adds a dual-threat aspect that the Texas A&M signee can’t. Calzada does possess a powerful arm that can blossom in college if he learns to play within an offense. Johnson is an ideal fit to take over for Sam Ehlinger in two years. Let’s get the elephant out of the room early: The health situation of Brown is more important than football and his health and recovery are more important than what he does for the future of the Texas program. Expect the Longhorns to use five-star athlete Jordan Whittington in the backfield early in his career. Spiller is an elite back with pedigree and stats as a premier running back, checking in at No. 30 on the 2019 Fabulous 55. He’s a balanced runner with patience and enough speed to break long runs. He’s the best back in this group and a player A&M hopes to build its offense around in the future. Oklahoma signed a strong pair of backs. Stevenson is a big, powerful runner coming in from the JUCO ranks to immediately help the Sooners near the goal line and in short-yardage situations. I watched Majors play his first game as a senior when visiting the state of Oklahoma to watch wide receiver Demariyon Houston, who was a UT commit at the time. Majors was the best player on the field. He’s a north-south runner with great pad level and finishing ability. A tie between Texas and Oklahoma could be justified, but we’re here for hot takes and I’ll give Texas the advantage because of the extra body. The trio of Haselwood, Wease and Bridges is cancelled out by the trio of Whittington, McCoy and Smith. The edge goes to Texas because of the potential of Washington and Lewis. Washington is a forgotten figure in the class despite winning MVP honors at the Under Armour All-America Game in Orlando after catching two touchdown passes. The one thing everyone can agree on: Big 12 secondaries are in trouble. Texas and Oklahoma each signed arguably the best receivers group in the nation and both are set at quarterback to unleash the young playmakers in 2019. Texas A&M’s receiving core is fantastic, but it lacks the same five-star buzz of Texas and Oklahoma. Brown and Wright are members of the Fab 55 and Smith was a great late addition for the Aggies. Lane was a prolific slot receiver at the TAPPS level. This one could be graded in three different ways and it’d be hard to argue against it. Oklahoma may have signed the best player in the group with Stogner. He’s a big, physical tight end who is ready to contribute as a freshman. He’s a real weapon when flexed out and is big enough to play with his hand on the ground. Stogner was the top-rated tight end on the Fab 55. The duo of Cupp and Wydermyer is tough to ignore. Cupp is considered the best tight end in the country by some and he has the potential to be that, though he wasn’t used in a way to justify those rankings in high school because of the scheme at Brock. Wydermyer could be the steal of the group with his raw athletic ability coupled with old-school tight end size. Texas’ duo is intriguing. Liebrock is a potential stud as a receiving weapon, but he’ll need to improve as a blocker to be a true three-down tight end. He’s a fantastic route runner and is a goal-oriented kid who wants to be great. Wiley is potential defined with his frame and athleticism. He played quarterback as a senior at Temple. This was another hard position to grade as a group because there are positives and negatives to each class. Oklahoma’s is the most well-rounded because of interior prospects like Ndoma-Ogar and Alexander. Wilkins is a potential star and Felix is a JUCO prepared to play in 2019. Texas A&M signed the best lineman in the group with Green, who is the No. 3-ranked player on the Fab 55. At 6-4, he might not be a long-term answer at tackle, however, and that’s concerning considering Robinson is a center. Texas gets the nod here because of Johnson and the long-term potential of Shepherd and Hookfin. 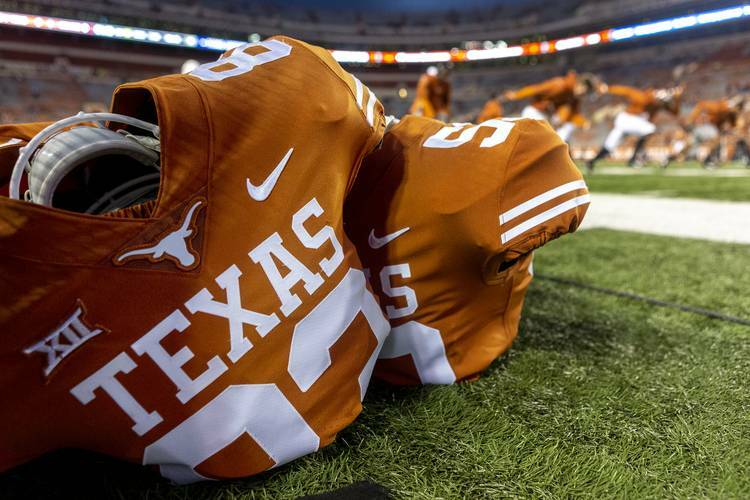 The Longhorns just need Johnson to live up to expectations and one of the other guys to blossom for assistant coach Herb Hand to feel fantastic about the 2019 group.